2.10 has a "new" symmetry tool. Helpful, however.... is there a way to show guides/lines from the origin point out per each axis of the mandala? While it's nice that it's new, it's difficult to see how many axis and where my lines start and end in relation to the number of symmetry segments. MandalaGaba does it well, but it does not have the editing functions we have come to enjoy and rely on such as Gimp does. 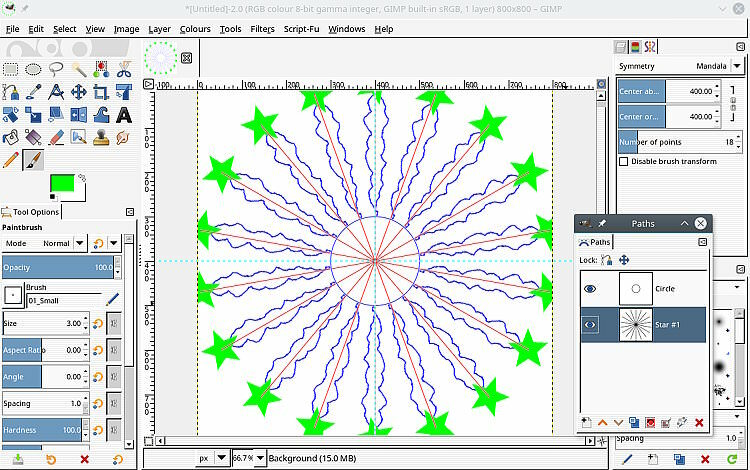 If anyone here has played with the Kaleidoscope in Corel Painter, the view of the axis is another example of the guide function. However, Corel Painter 12 stops at 12 segments, where Gimp has 100 AND a proper : tool. There aren't any built in lines, but it is quite easy to draw some. In the example, I created a new transparent layer. On this layer I drew a North-South Line. Then duplicated this layer and rotated it 120 degrees. Then go back to the North-South layer, duplicate again and rotate this one -120 degrees. Finally, merge the the 3 layers with the lines. Lines can be made invisible by using the eye, or the opacity of the layer can be reduced. I do not know much about those other applications and you sort of answered you own question in a way. You could use paths as an overlay. One advantage, they remain the same whatever the zoom value. This a really old script-fu shape paths but there are other/ more up-to-date plugins. Appreciate the swift replies and work-around. Adjusting 20 some lines as I shift the origin location, angle degrees, and change axis numbers isn't economical for the project or the product. I'll drop a suggestion in the dev site and hope for the best in future updates. In the mean time, feelers out for a plug-in for axis guide visibility. (10-10-2018, 02:48 PM)AndyG Wrote: Appreciate the swift replies and work-around. Adjusting 20 some lines as I shift the origin location, angle degrees, and change axis numbers isn't economical for the project or the product.